The committee directs external marketing and public relations for the local chapter including the creation and placement of all appropriate media. Manages efforts to present the local chapter to the community in a positive light, advance membership, promote the high ethical standards and professionalism of members. Develop and advance strategy for establishing AFP as a brand that is held in high regard. Increase positive of AFP chapter and its members within the local philanthropic community. The committee works with the other committees to promote diversity through membership, programming, and philanthropy. AFP has made great strides in encouraging people of diverse communities and backgrounds to join AFP; however, there is still much work to be done. AFP needs to be an association that is as diverse as the people represented by the organizations for which we work. The Ethics & Mentoring Committee is focused on the education of chapter members, Board members, and the public on the fundamental principles and ethics of the fundraising profession. This includes providing opportunities for chapter members to seek guidance from more senior members of the professional in one-on-one counseling sessions. The Fundraising Leadership Symposium Chair will prepare and execute a plan for the annual Fundraising Leadership Symposium program, while coordinating with the Professional Education Chair to provide a program that expands upon and aligns with the monthly programming. The goal of the committee is to develop an event that respond to the educational needs of chapter members and others in the community. The committee will secure an outside speaker to facilitate the program. The Government Relations Chair (GRC) will work with the President, Board of Directors and membership to provide regular updates on government relations issues. It is the Hampton Roads Chapter’s desire to become more knowledgeable and involved in government relations at the local, state and federal levels. 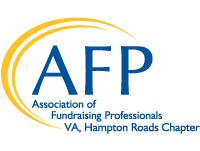 In 2018, the GRC will work to create a toolkit to help Hampton Roads AFP members better understand how each individual can become more involved for the good of charitable giving while also providing more frequent updates at monthly chapter gatherings. The Membership Committee is responsible for growing membership for the Hampton Roads chapter through recruitment and retention. The Committee executes the membership recruitment and retention plan, coordinates with the Diversity Committee and Programming committee to promote member involvement and diversity. The Committee corresponds with current and potential members and implements events to encourage membership and member involvement at the local and national level. These events include but are not limited to new member orientation, AFP Socials, networking opportunities. The National Philanthropy Day (NPD) Committee is comprised of board members and AFP general members to assist in the planning and execution of the chapter’s largest annual community event which celebrates the significant contributions of philanthropy with a local emphasis. NPD Committee members will attend regularly scheduled meetings which will include the following components: venue/catering, application creation and honoree selection, event promotion, event logistics, PR (pre and post event), printed materials, program (script, donor stories, video), VIP/honoree reception, and more. The NPD Committee offers many opportunities to get involved by using existing skills, enhancing skills and/or networking with development professionals. The President shall be the chief elected officer of the chapter, shall preside at all meetings of the chapter and shall be an ex-officio member of all committees. The President shall conduct all business meetings using the parliamentary authority chosen by the chapter. As the chapter’s chief elected officer, the President shall be responsible for all chapter business. He/she shall ensure that decisions, orders and resolutions of the Board of Directors are delegated and carried out, and that all required correspondence and reports are transmitted to AFP International Headquarters on a timely basis. The President-elect shall have authority as and assume the full duties of the President in case of his/her absence. The President-elect shall, in most cases, succeed the President in the leadership track. The chair is responsible for facilitating board orientation and assisting the President with a board governance. The chair will develop the annual budget for approval and provide guidance for the finance committee. Additional responsibilities include facilitating the Be the Cause Campaign, educating membership and securing 100% board support. The program committee develops and coordinates monthly educational programs and webinars for the chapter. The committee also coordinates special programs such as CFRE Review Course and Fundraising Fundamentals Workshop for the chapter on a biennial basis. The goal of the program committee is to respond to the educational needs of chapter members and other in the community. The secretary will prepare and distribute accurate minutes of all meetings of the chapter and Board of Directors (minutes of committee and member meetings shall be recorded if directed by the Board of Directors). The Scholarship Committee is responsible for marketing scholarship opportunities made available through the Hampton Roads chapter. The scholarships include: the Virginia Fundraising Institute Scholarship, the Newcomer Scholarship, the Diversity Scholarship, the Chamberlain Scholarship for the AFP International Conference and the Diversity Scholarship for the AFP International Conference. The Committee publicizes the scholarships and selects the winners of the various scholarships with input from the AFP Board. The Committee corresponds with applicants and encourages individuals interested in learning more about philanthropy to apply for the scholarships. Information about the scholarships is listed on the AFP-HR website. The Sponsorship Chair and committee is responsible for marketing sponsorship opportunities made available through the Hampton Roads chapter and events. The sponsorship opportunities include, but our not limited to: National Philanthropy Day, Fundraising Leadership Symposium, pop-up workshops and monthly programming. The chair is responsible for encouraging board participation, tracking sponsorship requests and benefits. The Treasurer shall be the fiscal officer for the chapter and is legally responsible for all funds, as outlined in the Chapter Bylaws. The chair will maintain all financial records, collect debts, make payments as authorized by the Board of Directors and provide the President with financial information needed from chapter records. The chair is responsible for monthly deposits and all other chapter receipts, in a timely manner. He or she will assist in preparation of the annual budget and monitor chapter expenditures Monthly financial statements will be provided prior to each executive committee meeting. A joint venture agreement among six of the AFP Virginia Chapters: AFP VA Shenandoah Chapter, AFP VA Central Chapter, AFP VA Piedmont Chapter, AFP VA Hampton Roads Chapter, AFP VA Tri-State Chapter and AFP VA First Chapter to convene as a group to conduct statewide business of interest to the chapters. Conduct a statewide educational event currently called the Virginia Fund Raising Institute (VFRI).